This entry was posted on Saturday, February 19th, 2011 at 7:47 pm	and is filed under Home Automation, Linux. You can follow any responses to this entry through the RSS 2.0 feed. Both comments and pings are currently closed. Wow this looks really good! I just ordered a SmartLinc and I currently have an Android phone, so this would be a HIGHLY desireable app to have. Thanks also for the explanation, since it didn’t make sense to me why the OS mattered (figured any browser would really operate independent of any OS controls/limitations). Please continue to post updates or please contact me as you progress in making this app. The iPhone apps that control Insteon studd can be pretty expensive, so this could be a lucrative project. 🙂 thanks! The bug can be worked around. It drove me crazy, but found a solution. Not sure if you app is native or browser based. If you write the first byte of a Get/Post then write the remaining, it will work without the bug. Thanks for the info. It is a browser based app. I doubt there’s a way around the bug at this high of a level. I’m open for suggestions though! The marketplace is severely in need of an Android Insteon controller. I recently installed an Insteon system in my vacation home and was shocked that the only controller out there, without having to have a PC based system running in the house, or and ISY99 (?) is the Mobilinc app for IPhone. To top it off, they are getting $20.00 per installation. Keep designing! You will have buyers! 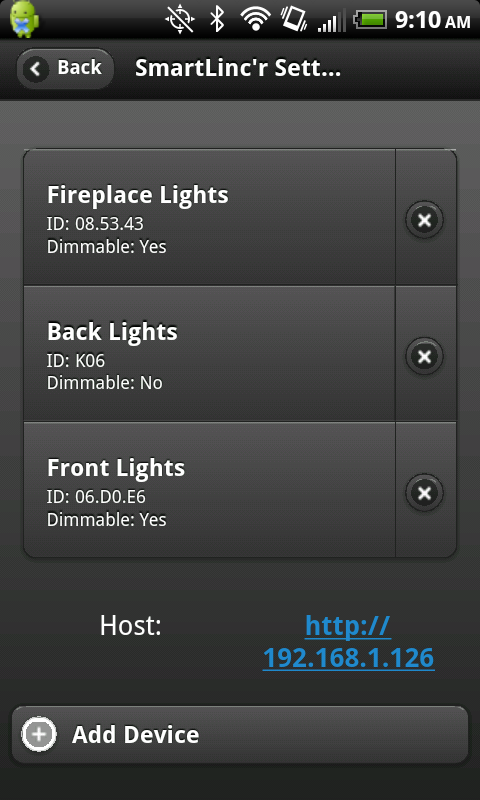 Smarthome themselves are looking for the first really good app. Who knows, maybe your product will become the next Smarthome recommended controller. If you need a beta tester, I’m your man! I hate using my phone browser to control my Smartlinc. It sometimes works my lights & almost never works on the thermostat. PLEASE let us know if we/I will be able to buy your app! Would love to see this become available on the marketplace! Let me know if you need anyone to beta test it for you. would love to have your app and/or beta test it for you. when do you think it will be ready? I need to come up with an icon and ‘sign’ the app and then I can work on distributing for beta testing. You’ll have to enable third party apps of course. Can you send me an email when you are ready for me to download it? anything new on the app?